The Optimum SubWear range is designed to keep you warm and prepared even on the coldest days thanks to its heavyweight quilted nylon construction. This jacket has a particularly long length to cover legs down to where socks will be. It also has a Velcro fastening for quick on and off. 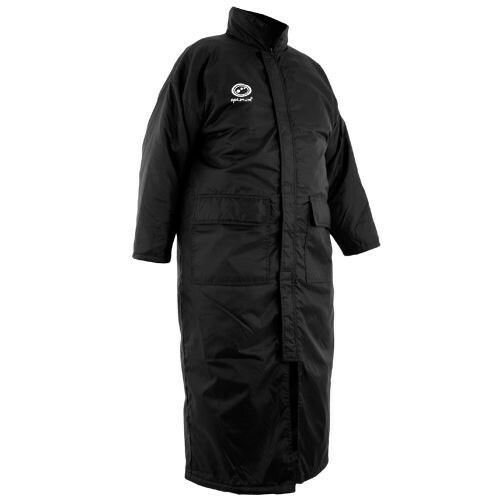 Great item for the rugby fan, keep toasty on those cold match days. Print: because of the fabric type print (Nylon Vinyl) is NOT guarenteed. We would advise any print on Sub Coats or Sub Suits be embroidery, which in turn can effect the waterproofing qualities of the item.